The Villages® community in Florida is one of the largest age-restricted active adult communities in the state - as well as the world. What started as a small neighborhood in 1978 has blossomed into a sprawling community that will eventually be home to an estimated 56,268 households of residents aged 55 and better. The Villages® community in Florida spans three counties, three zip codes and over 20,000 acres. The entire community is connected by over 100 miles of golf cart legal streets and trails. This 55+ community is an entirely self-sustaining town complete with retail establishments, restaurants, banks, post offices, healthcare centers, and countless recreational amenities. Residents of The Villages®, known as Villagers, have flocked to the community from every state and several countries to be a part of what is boasted as Florida's Friendliest Hometown. The community has drawn retirees from around the world with the lure of warm weather, quality ranch homes and free golf for life. This community in central Florida has appealed to mature adults because it offers a lifestyle unmatched by any active adult community in the country. In fact, every week a 50-page newsletter and activity guide highlights all of the various clubs, activities, and events for the week. There are more amenities per capita in this active adult community than any city or age-restricted neighborhood in the country. The community is designed around the notion that every resident should have simple and convenient access to the various amenities. To accommodate this there is a combination of town squares, retail plazas, golf courses, and recreation centers spread throughout the development. The Spanish Springs Town Square is reminiscent of the old southwest with its storefront shops and fountains decorated in a southwestern flare. Spanish Springs Town Square has many inviting attractions including a hotel, more than a dozen restaurants and over 30 retail establishments. Katie Belle's is a resident only, two-story Western-style opera house that provides great dining and dancing every night of the week. The square's movie theater, The Rialto Theater, plays all of your Hollywood movie favorites throughout the year. The Sharon Morse Preforming Arts Center is also located in the Spanish Springs Town Square. There are amenity centers spread throughout this age-restricted community that currently include eight regional recreation centers, 17 village recreation centers, and 25 neighborhood recreation centers. The regional recreation centers host the largest array of amenities and generally include a fitness center, hobby and craft studios, meeting rooms and ballrooms. The regional recreation center also offers a variety of swimming pools known as sports pool where lap swimming, water aerobics, and water volleyball are held. There are also various sports courts such as tennis, bocce ball, shuffleboard, pickleball, and basketball. The 17 village recreation centers throughout the community typically include a small clubhouse with meeting rooms, billiards, catering kitchens, bocce, horseshoes, shuffleboard, and family-friendly pools. The 25 neighborhood recreation centers are conveniently located in most neighborhoods and include adult-only pools plus bocce ball, shuffleboard and horseshoes. The unique mix of recreation centers spread throughout the neighborhood ensures that residents always have simple and convenient access to their desired amenities. In addition to the recreation centers, there are also countless other desirable amenities within the community including tennis, pickleball, bocce ball, shuffleboard and basketball courts. There are many catch-and-release fishing lakes and nine softball fields that play host to over 200 softball teams. A polo field with grandstand seating is a particular favorite for many residents, especially because it is nestled near Ocala in central Florida, the acclaimed "Horse Capital of the World". Nearly every imaginable amenity can be found in this 55+ community, including two bowling alleys, a library, woodworking shop, numerous hobby and craft studios, and RV parking. There are ten places of worship in the community providing Catholic, Protestant, Methodist and Jewish services. The Villages® community's Regional Medical Center and other healthcare centers offer medical testing, diagnostics, treatment, and rehabilitation. The Savannah Center is a large southern-themed auditorium with stadium-style seating. It hosts many big-name performances, touring shows, guest speakers, orchestras, comedy acts, and local talent. Golf enthusiasts will find a golfer's paradise in this active adult community. Residents enjoy free golf for life at any of the 36 executive courses as well as 12 country club courses. The Villages ® community also offers a state-of-the-art golf academy. Golfers of all levels can take group or private lessons so they can improve their game with golf instruction or just learn the basics. Life is a never-ending assortment of fun and activity. Ask any Villager about their experiences in the community and you are sure to get an earful about how exciting it is to live The Villages® community lifestyle. Many compare it to being a kid all over again, others say it is like living in a resort all year round and some remark it’s like going back to college - without the responsibility of homework or attending class. There are an estimated 1,800 or more different clubs and groups that represent almost any imaginable interest or activity. A new recreation, activity and event newsletter is delivered to the residents each week. This 50-plus-page document highlights everything the community has to offer to its residents. Arts and crafts enthusiasts can partake in activities such as ceramics, painting, quilting, and woodworking. Dancers can take their pick of tap, jazz, line dancing, square dancing, ballroom dancing, ballet and more. Health nuts have a never-ending assortment of fitness classes, aerobics, yoga, power walking, and weight training. If your interests are in music and theater, you might consider joining a choir group, band or theatrical group. This community has an assortment of social clubs that represent many interests and ethnic groups. These clubs have resident groups from all 50 states and several countries. This age-restricted neighborhood also has special interest clubs for things like clowning, bird watching, collecting, astronomy, photography, genealogy, and scuba diving. For the sports enthusiasts, there are countless sports teams, leagues, and tournaments in everything from tennis, pickleball, and golf to softball, biking, and bowling. Regardless of your interests or passions, you will surely find other Villagers who share your zest for getting the most out of life. The real estate market includes many types of housing options ranging from intimate villas to luxurious single-family homes with golf course views and everything in between. There is a housing type, size, and price to suit the needs of almost any active adult buyer. Since the community started construction in 1978, approximately 100 different floor plans have been offered. The floor plans are divided up into seven different categories including patio villas, courtyard villas, cottage-ranch homes, designer homes, and premier homes. Each series offers a unique set of included features and available upgrades. There are smaller, less-expensive homes designed for simplistic living at a reasonable price or larger units, which offer highly upgraded finishes tailored for residents who want luxury living. There are both new construction and pre-owned resale homes in The Villages® community. Many of the resale homes are highly desirable for their reasonable prices and already included upgrades such as landscaping, window treatments, screened lanais, and other popular add-ons. There are a variety of pre-owned resale homes for sale in The Villages® community in Florida that can provide you with the ideal opportunity to find the home of your dreams at the lowest possible price. Prior to purchasing real estate in this active adult community, it is advisable to entertain all of your options by reviewing the many available resale homes. 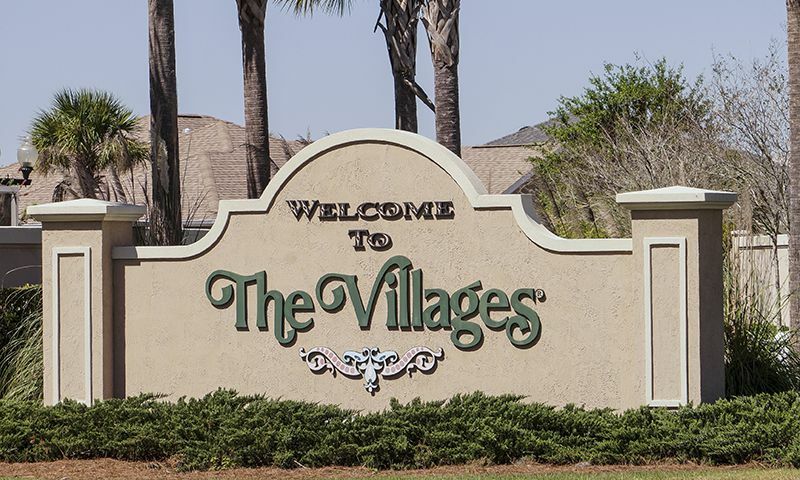 The Villages® community is located in Lady Lake in the heart of central Florida. This ideal location places the community within 90 minutes to some of the most desirable attractions in Florida including Tampa, Orlando, the Gulf of Mexico and Atlantic coast beaches. There are many popular surrounding destinations including the quaint lakefront towns of Leesburg and Mount Dora 20 minutes south. The Ocala National Forest 20 minutes to the northeast offers fun activities like canoeing, boating, fishing, hiking, and biking. When grandchildren come to visit, there are many great nearby attractions like the Florida Horse Park, which offers fun rodeos, tractor pulls and 4H shows. Places like the Kennedy Space Center, Disney World, Sea World, and Universal Studios are accessible in less than 90 minutes. Closer to home, this community is surrounded by an enviable array of shopping and dining outlets. There are approximately 200 retail stores and 60 restaurants accessible via golf cart in and around this community. Options range from local boutiques to name brand favorites and chain stores. Whatever your interest, this 55+ community in central Florida has everything to offer active adults and it's only a golf cart ride away. There are plenty of activities available in The Villages®. Here is a sample of some of the clubs, activities and classes offered here. Homebuyers can choose from a selection of manufactured homes that offer two to three bedrooms, two bathrooms, and a carport or garage for a car or golf cart. Please Note: Floor plans are not available at this time. Patio Villas offer 1,163 to 1,190 square feet of living space. These smaller homes have two bedrooms, two bathrooms, and an attached one-and-a-half-car garage. Bungalow Villas offer more space than the patio villas. These homes range from 1,157 to 1,667 square feet. They have two or three bedrooms, two bathrooms, and an attached two-car garage. Cabana Villas offer 1,161 to 1,665 square feet of living space. They have two or three bedrooms, two bathrooms, and an attached one-and-a-half-car garage. Cottage Homes offer 1,255 to 2,003 square feet of living space. They have two to four bedrooms, two bathrooms, and an attached one-and-a-half or two-car garage. Designer Homes come in a variety of floor plans. These single-family homes range from 1,392 to 2,565 square feet of living space. They have two to four bedrooms, two to three bathrooms, and a two or two-and-a-half-car garage. Premier Homes are the largest series of single-family homes in The Villages. They range from 2,472 to 4,705 square feet of living space. They feature three or four bedrooms, two to three bathrooms, and an attached two or two-and-a-half-car garage. 1 1/2 hr/// every possible restaurant, shop, retail stores within 5-20 min and bigger cities Leesburg and Ocala with bigger retail stores within 20-30 min/// close to Ocala National forest with hiking, biking, kayaking, airboats ,lakes within 20-30 min/// 2 concert theaters centers in The Villages provide plays,concerts, international shows daily so plenty of culture right here!! All homes are privately owned and the landscaping is just gorgeous with flowers, trees, lakes, marshes, golf courses and beautiful views everywhere you look. Over 130 miles of golf cart trails make everything accessible by golf cart whether activities, rec centers,shopping, medical, restaurants, pools etc. Golfers paradise with over 43 golf courses, most of which are free. 3 town squares offer live music, dancing, happy hour every day of the year. Although a very large community, I've found it's actually just many smaller groups all working within this larger development sharing the same goal to live a healthy active lifestyle, socialize and have fun every day, This lifestyle may not be for everyone, but if you want to stay healthy, keep your body and mind active and feel like you're on vacation every day, this is the place for you!! Every day I wake up and look outside to my "PARADISE" and count my blessings that i live in the best retirement community in the world! I have lived in The Villages for almost 2 years. I moved here from the NW mountain states leaving behind long, rough, winters. The Villages has much to offer but in the end it’s not for me. One word can sum up the greatest advantage here, convenience. You can ride your golf cart to the supermarket, doctor, dentist, bank, shopping, dining, entertainment and more. They say that it’s common for people to go into a home sales contract on their first visit. But that’s easy to understand. If you live out of state and have a limited amount of time to visit, The Villages holds all the cards. Their bus tour followed by a Villages realtor home tour, along with the multitudes of country clubs, rec centers, hobby clubs, 3 squares, can be a compelling experience for a short period of time. But after living here I really don’t care that there are 15 country clubs or 40+ pools within 5 miles of me. All I really care about is what is closer to me. The Squares included. With a population of over 150,000 retired residents there is a massive service machine that has grown to meet the demands of people that no longer want to do yardwork, home repairs, insect treatments, lawn treatments, and nearly everything else. The hundreds of yard crews (which the owner must find themselves) fly around like bumblebees to each house in each neighborhood (Village) mowing, edging, trimming, fixing, cleaning, and blowing. It can get noisy early in the mornings and since most homes are very close to each other even your neighbor’s crew can wake you at times. The Villages can be a VERY busy place. The location in the state is very rural. Landlocked of course. The Villages border 2 small towns, Wildwood and Lady Lake. It is close to the larger city/town of Leesburg. But the Villages based on its population and size has the spotlight. There is very little local “culture” here besides what is driven or flown in. They do have concerts, shows, and festivals on their squares. But all of it might as well have been airdropped in. There is no indigenous city to go to to enjoy yourself or participate in any of their activities or festivals unless you drive 30-50 minutes away. Outside of the entertainment, shows etc, chain restaurants like Bob Evans, Golden Corral, & Red Lobster are the mainstays. During “snowbird” season November-April the population grows by about 40%. It gets very crowded as golf vacationers come down and many bring their sons and daughters and their kids down during many parts of that period to visit them as well. Traffic, lines for restaurants, driving accidents, DUIs in golf carts, and just crowds for nearly everything can be cumbersome. There can be some contention/resentment between the visiting seasonal “snowbirds” and the “frogs” (full-timers). As stated, it is a substantial population increase and subsequent demands on the facilities. In terms of homes if you like varieties of earth tones cast in siding and stucco you’ll like it here. Uniformity is key. But many homeowners have large disposable retirement incomes so outdoor projects from driveway designs, to edging creations, bird cages with swimming pools and much more drive the Jones to try and outdo one another. The Villages IS NOT a gated community. The gates are primarily for traffic and flow control. There are no controls for entry to any of the gates and Villages. Simply press a button and you’ll be let in. No questions asked. In summary there is much to do here. But as many have coined the term, it’s a “bubble” and many residents would have it no other way. If/when you come to visit don’t let the hoopla overwhelm you into a rash decision. Florida has numerous 55+ communities many that are closer to the coasts and larger cities. While 150,000 residents may sound appealing the “bubble” can get tiresome. Driving through traffic circles back and forth to get nearly everywhere amongst many elderly drivers can get old quick if you are planted by living there. There is a lot of like for sure but a lot to dislike also. The entire state of Florida is popular for retirees look around carefully. Bigger is not always better. It can be worse. The Villages is the only place to retire. I have been living here for over 2 years and just love it. With 83+ pools, 48+ golf courses, approx 3,000 social clubs and 3 town squares were we have restaurants, shopping and have Free nightly entertainment 365 days a year. I live, I love and I sell real estate in The Villages. I have been here since 2001. Many people come here looking for a fantasy life full of nothing but fun and games all day long. Yes, the villages has everything you could possibly want, but it is all average. There is nothing here above average except maybe a few golf courses. It is a place where HUMANS live and have HUMAN problems and HUMAN needs. It is not the land of sunshine, lollipops and rainbows. If you can accept this, you will enjoy living here very much. Just an ordinary town in the middle of nowhere. The Villages is amazing! Over 100,000 people live here and it's a golf car riders dream. Multiple town centers with restaurants, shops, and bars. Nearly 40 golf courses. It's Disney World for retirees! I love it! This is the most amazing neighborhood I have ever seen. You can travel everywhere by golf cart, there is live music every night, tons of great places to eat and grab a drink. It has a sense of community that I have never experienced before in my life. Love this place! I recently visited the Villages. A friend of mine wanted me to go in on an investment property until they can retire, so we went to visit. I saw the sign 'The Friendliest Place In Florida', but it was far from it... people were rude, nasty and ignorant. We found that people would unabashedly stare at our golf party at the clubhouse after a round of golf. I'm not sure why; because we were a group of women? If you want a place with no diversity, well then you have come to the right place. An older white man wanted to know why our group of women 'wasn't home washing dishes' instead of playing golf. I do not recommend this place for vacation. It was not a good experience at all. An unbelievable wood shop with every tool known to man or woman that you can join if wood working is your passion. Old cars?? Cruise night in Spanish Springs will keep you entertained. I work in the Property management business here and I love meeting the first timers that come to stay with us for one to three months in the winter. Believe me they come back year after year and this year as in previous years I will be assisting some in purchasing their first Villages home. It is so much fun!! Love it here. We are FROGS. Here til we croak!! We have lived in The Villages for 5 years and we love this lifestyle. I play golf 3 days a week, softball 3 days a week, trivia Wednesday evening, listen to the music at Village venues a few times a week and what ever else I can fit in. My wife also plays golf, softball, Mexican train, bunco, trivia, poker, decorates cakes. We eat out 2 or 3 times a week and most of our activities and shopping are traveled to in one of our golf carts. If you are looking for a retirement community that isn't like the others come and see The Villages. Low amenity fees, low housing costs, no state income tax. Check out the amenities tab at the top of this page. The last thing I wanted to be was a "typical" Florida retiree but buckled under pressure to at least visit "The Friendliest Hometown" so that I might scratch it once and for all off my "to do" list. I was absolutely wowed from the first day we arrived! Moving here was not a snap decision, though. We visited at least 4 times before deciding that this was the active social lifestyle that was right for us. 5 years later, we are still watching it grow and ave never been more active, physically and socially. Seasonal activities previously done a few months a year in the North, can be done year round. We now bike, kayak, dance, play bocce, bowl, golf and attend various types of exercise classes. Wish we could keep The Villages a well guarded secret but it is everything we could want and more! Thank you Mr. Schwartz and Mr. Morse!! You have amazing vision! We moved her from Tennessee nearly 6 years ago. Since that time, we have kicked ourselves for not moving here earlier. This is truly a remarkable place that is hard to describe. Nonstop activities, great people and great weather. If you are retired and living anywhere but here, you are truly missing the boat. You cannot imagine the actual scope and quality of life in The Villages. You can read all the material here about it but you have to really see it with your own eyes to comprehend it. The place is amazing; there are over 1944 'clubs or interest groups'. If you are bored here, it is your own fault. It's beautiful; they change the flowers 4 times a year. It's fun, there are over 500 holes of golf - even if you don't play, there is more to do than you can fit on your calendar. It's a complete community with a build out population of about 100,000 people. If you wanted to start a group that was interested in collecting Peruvian air mail stamps issued before 1940, I'm pretty sure there would be at least a dozen other people interested. We have our own hospital, 3 town squares, Philharmonic Orchestra, choral group, - you name it, we've got it. You will not be just buying a home, you're buying a life style. Try it, you'll like it. 55places.com is not affiliated with the developer(s) or homeowners association of The Villages®. The information you submit is distributed to a 55places.com Partner Agent, who is a licensed real estate agent. The information regarding The Villages® has not been verified or approved by the developer or homeowners association. Please verify all information prior to purchasing. 55places.com is not responsible for any errors regarding the information displayed on this website.